The editors of Anthropoliteia would like to welcome Nicholas Barnes with the latest entry in our developing forum, Security in Brazil: World Cup 2014 and Beyond. The scene was impeccably staged. The Special Operations Police Battalion (commonly referred to as BOPE and famously depicted in the film Elite Squad and its sequel) had set up a temporary command center on the edge of the plaza. More than a hundred of their police, armed to the teeth, with bulletproof vests and helmets, were milling around in the sweltering heat with nothing to do after taking control of the area without a shot being fired. Sky, the television company, had set up a small table under an umbrella and was hoping to sign up residents for their cable package. A helicopter made low passes over the plaza. City sanitation workers pushed around piles of garbage, pretending to work. In the midst of all of this, BOPE police were giving rides to kids on several horses as dozens of journalists snapped photos of the delighted children. Later in the afternoon, BOPE raised their flag alongside the Brazilian national flag in the middle of the plaza. With much pomp and circumstance, Complexo da Maré, the largest group of favelas in Rio de Janeiro, had officially begun the pacification process. Located in the sprawling, industrial northern zone of the city, Complexo da Maré is a cluster of 16 favelas with a population of roughly 130,000. It is a public security concern because it is home to several non-state armed actors (two separate gang factions and a militia) and is located at the intersection of three of the major traffic arteries that connect the international airport to the rest of the city. I have been residing in Maré for the past year conducting dissertation field research. This has allowed me the opportunity to witness BOPE operations first hand and interview residents and community leaders about the tenuous and shifting public security situation. I will argue that BOPE’s pattern of abusive tactics and violence comprised an overall strategy to threaten and terrorize these communities into submission in an effort to “retake” these favela territories. And while such a strategy may have produced more effective tactical operations and short-term results, it is counter-productive to the pacification process in the long run and requires a major reassessment by the public security apparatus moving forward. 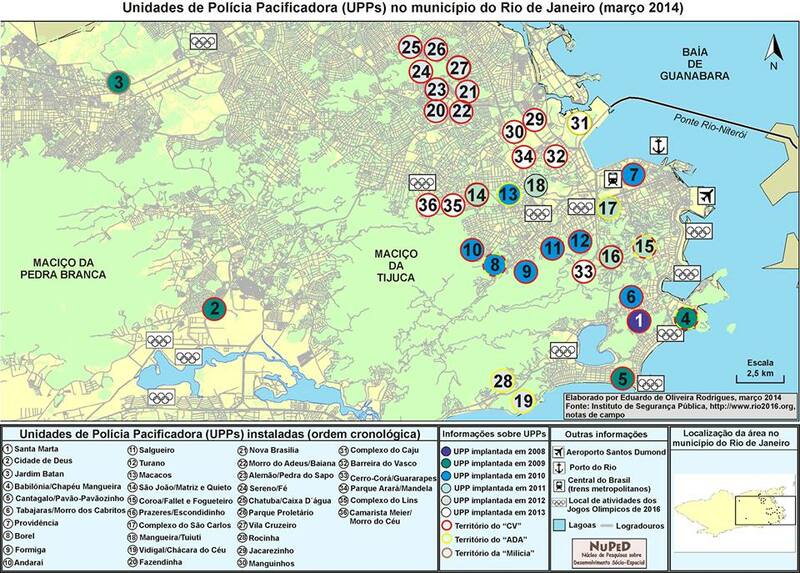 Rio’s police pacification program began in 2008 with the plan to wrest control of many of the city’s favelas from powerful drug-trafficking gangs and install permanent proximity policing units in these communities. As of May of this year, it has reached approximately 264 separate favelas and an estimated 1.5 million inhabitants. BOPE is instrumental to the pacification program. They are tasked with the most dangerous operations and invasions and remain in some areas for weeks or months carrying out sweeps and “cleansing” the area of firearms, drugs, and dangerous elements until a pacification police force is installed. One of the most noticeable aspects of BOPE is their all-black uniforms, cars, trucks and other vehicles on which they proudly display their symbol, a knife in the skull (“faca na caveira”) superimposed on two pistols. According to the BOPE website, the symbol stands for resilience in the face of death but it is also intended to send a less than subtle message to gang factions and their conspirators. BOPE officials’ rhetoric expresses their understanding of favelas as enemy territories. Their common refrain is that those on the side of good (“o lado do bem”) have nothing to fear from BOPE which implicitly suggests that those complicit in gang activities have every reason to be afraid. Putting the situation in such stark terms reinforces and justifies BOPE’s treatment of these communities. The symbol, therefore, remains an accurate depiction of BOPE’s ethos and is indicative of their violent and terrorizing behavior in the favelas. their operations are part of a largely symbolic campaign aimed at reestablishing the legitimacy of the state. Erika Robb Larkins (2013) has correctly pointed out that much of BOPE’s behavior is performative in nature. They have fostered a culture of violence and quasi-mystical identity within their ranks that is frequently expressed through violence in Rio’s favelas. Moreover, their operations are part of a largely symbolic campaign aimed at reestablishing the legitimacy of the state. The well-orchestrated plaza scene I describe above is a prime example of this propaganda campaign whose audience is obviously not the residents of these favelas. There is also, however, a more strategic element in BOPE’s demonstrative and violent behavior in favelas. By making frequent displays of their firepower and training, regularly threatening residents, and responding to any provocation with extreme violence, BOPE is sending a very clear message of deterrence to communities and gangs. The ideal for BOPE is an operation like the one described above where not a shot is fired and they can display their effectiveness to the media and general public. This requires gang members to avoid any type of confrontation and residents to tolerate abuses and search and seizure without protest. One example of this deterrence strategy is the use of militarized vehicles during BOPE operations. The caveirão (“big skull”) is an enormous armored vehicle designed to withstand gunfire from assault rifles as well as high-powered explosives. It is replete with a 360 degree gun turret and can transport as many as 12 police in and out of favelas. While the caveirão is extremely effective at protecting police from gang faction gunfire and has saved many police lives, it has failed to improve public security in these communities because it treats them as enemy territories and all residents as would-be criminals. In an open letter to Rio’s governor in 2006, various non-governmental organizations wrote that the caveirão’s in favela operations constitues an instrument of intimidation and remains contrary to the most basic human rights. The caveirão is usually joined by attack helicopters that fly low over the community, creating a sensation of being under siege. 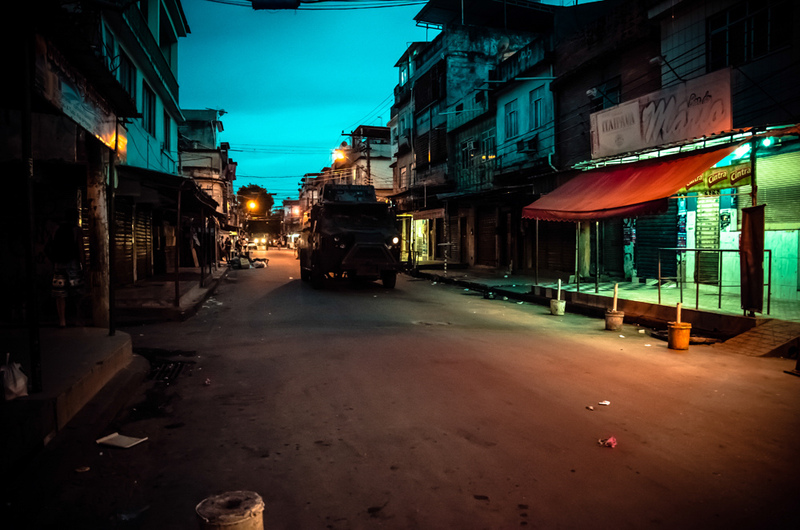 The caveirão and their helicopters have made frequent visits to Maré in the past several years and watching the armored vehicle lumber down the narrow streets or hearing the helicopter pass overhead is truly a frightening experience. Upon BOPE’s arrival, gang members and residents alike usually find somewhere to wait out the operation. For this reason, most BOPE operations occur without direct confrontations with gang factions (see Larkins 2013). If individual police are engaging in illegal and abusive behavior then such tactics remain an authorized or at least tacitly accepted part of BOPE’s repertoire of violence. Since BOPE began to carry out operations in Maré in 2011, they have engaged in many home invasions without warrants. They have ransacked homes looking for drugs and guns, stolen documents or money, and threatened and terrorized residents. BOPE carries out such invasions generally because they suspect involvement with gangs or drug use. In one case in March of this year, police invaded a house where they believed youths to be using drugs and beat up the adolescents before locking them in a bathroom. Touring the house in the aftermath, the boys’ parents showed me the destruction BOPE left in their wake as they unsuccessfully searched for drugs. BOPE commanders argue that such behavior is condemned by their organization and that incidents have become less frequent over time. In the same breath, however, they say that it is impossible to regulate the behavior of all police and abuses are bound to happen. Such statements contradict the discipline and professionalism for which BOPE is famous. If individual police are engaging in illegal and abusive behavior then such tactics remain an authorized or at least tacitly accepted part of BOPE’s repertoire of violence. Moreover, because BOPE police are seldom investigated less disciplined for incidents of abuse and violence in favelas, they are unlikely to change their behavior anytime soon. In June of last year, a BOPE Sergeant was killed in a shootout with one of the local gang factions after police followed suspected criminals into Maré. BOPE police then proceeded to take the favela by force in the early evening when most residents were arriving home from work. Over the course of the next 24 hours, BOPE invaded numerous homes, confiscated documents and money, terrorized residents by shouting death threats from the street and, in the end, killed or summarily executed nine residents, some of whom were alleged gang members. Most of these deaths occurred inside the homes of the alleged victims, some of who were purportedly tortured and killed with knives, according to residents I interviewed. BOPE rarely makes arrests (see Larkins 2013) and such summary executions are not uncommon for them or the public security apparatus, in general, though cases of deaths at the hands of Rio’s police have decreased over the last several years from an absurd number of 1330 cases in 2007 to 405 in 2013 (calculated from the Institute of Public Security official statistics—available here). I would argue that BOPE’s willingness to inflict extreme violence on gangs and terrorize and brutalize communities when provoked is an essential component of their strategy. In interviews with current and former gang members, Rio’s criminal organizations are mindful of this and have learned to largely avoid major confrontations with BOPE precisely due to the likelihood of reprisals and vengeance killings. This has allowed BOPE to invade and take control of the majority of pacified favelas with little violence. However, despite BOPE’s extensive training, superior weaponry and obvious willingness to use them, they cannot be in all places at all times. The gang faction strategy in pacified communities where they continue to have a strong presence appears to be to wait for BOPE to leave and attack pacification police forces surreptitiously (see here, here and here for examples of this strategy). In addition, the number of pacified territories and populations has swelled over the past two years with the expansion of the program to many of the huge favelas of the northern zone. This has forced the redistribution of pacification police across some of these areas and is likely responsible for precipitating the increased levels of violence in the city over the first several months of 2014. BOPE has even been asked to retake control of the most violent areas while continuing tactical operations in other locations. Moreover, BOPE’s military equipment and tactics, summary executions, and the abuse of citizen rights directly undermine the legitimacy and accountability of the pacification program in the long run. The pacification program was originally intended to not just take back control of these communities but also reform an abusive and corrupt police apparatus from the inside out by paying police better wages, providing them training in human rights, and holding them more accountable. This effort has taken a back seat to asserting state control and dominance in the short-term. For this reason, many pacification units around the city more closely resemble occupation units with little cooperation between police and the community. BOPE has even recently begun to train the pacification police in their tactics. Such a development will lead to the further militarization of pacification units. This would be disastrous as improving the security situations in favelas requires fostering trust between community members and a responsive policing apparatus. The more these relationships deteriorate, the more likely residents are to turn to drug gangs for providing such security. residents in Maré organized several days of protest, demanding an end to police violence, the removal of the caveirão from their streets and an investigation into the massacre. Nearly a year later, the investigation is ongoing. For their part, many residents are indignant but still unlikely to make formal complaints against BOPE as a way of improving their security situation because of their lack of faith in the police apparatus and their fear of reprisal from both police as well as gangs. A woman, whose house had been broken into by BOPE police and used as a base of operations, just shook her head without even really thinking when NGO workers I was accompanying asked if she wanted to make a formal complaint. The risks are just too great when they know that nothing is likely to be done. Residents will frequently recount personal abuses at the hands of BOPE police or even episodes of extreme violence that they have witnessed but almost unanimously refuse to make denunciations. In addition, the law of silence in favelas controlled by gang factions dictates that residents who talk to police will be punished accordingly. For these reasons, only in rare cases do communities respond with outrage and mobilization. For instance, following the massacre last June, residents in Maré organized several days of protest, demanding an end to police violence, the removal of the caveirão from their streets and an investigation into the massacre. Nearly a year later, the investigation is ongoing. Following the pacification invasion of Maré, local NGOs and Residents Associations called a public audience with the Secretary of Public Security, Mariano Beltrame. They presented several measures to hold public security personnel, especially BOPE accountable. Among them were demands for regular meetings to monitor public security agents, the strict requirement of a legal warrant to enter households, and the involvement of local organizations and residents in the mediation of local conflicts arising from the actions of security forces. For his part, Beltrame seemed receptive to some of the proposals and promised to install ombudsmen on the streets to address the violation of rights by BOPE and other police. This is a move in the right direction but the reforms need to be broadened and reinforced before the military leaves Maré after the World Cup ends and BOPE and military police regain responsibility for the area. The past several years of BOPE operations have undermined the pacification process in significant ways but creating avenues of oversight and accountability, while not a panacea for the public security problems found in Rio’s favelas, will be a step in the right direction. BOPE took control of Maré on March 30th. Only a week later they handed the area over to the armed forces. Maré remains, until today, under military occupation. Residents Associations are favela-level informal democratic institutions that are designed to represent the interests of the favela to public services and institutions. Nicholas Barnes is a doctoral candidate in comparative politics at the University of Wisconsin-Madison. For the past year, he has been living and conducting dissertation field research in Complexo da Maré, a recently pacified group of 16 favelas in Rio’s northern zone. His research is funded by the National Science Foundation, Fulbright-Hays Dissertation Fellowship and the Social Science Research Council’s Drugs, Security and Democracy and International Dissertation Research Fellowship Programs. I went to Rio before the World Cup. I was robbed and didn’t feel safe. I hope peace prevails for this region. I completely agree with BetweenTheLines comment, while an avid sports fan, it’s disheartening as someone, who not only who once lived in Belo Horizonte and has seen similar condition, but I have a firm belief that sports have the ability to unite people. We see this in countries all over the world, we have seen this before even in Brasil. The love of country and game brings souls of every economic status together. Yet, instead of investing in sewage systems, running water and basic needs to show their fellow countrymen that they deserve such “luxuries”, they chose their love for money and exploited the game. The power,for some, is the sport. This will happen again in 2016, when the Olympics return. When you have greedy people on top with something to lose, and families, children, and communities, on the bottom with nothing to left to lose, that is when you will discover the best and the worst in people. That’s a high-pressure situation on a massive scale. Thank God it hasn’t dissolved into utter chaos. I think as the games go on the tensions will settle, and this will prove to be a great thing for Rio and the country as a whole. I’d love to know what is your plan then for pacification of the favelas? We are talking about dangerous, horrible gangs that have full control of the area and frequently terrorize the residents of the community and recruit the young children of the favelas early on into a criminal life. I get that crazy violence is not the answer and there has to be a middle term, but the police also need to fight fire with fire as the gang members WILL kill and torture the police officers if given a chance to do so. I was born and raised in Rio and even today when I go back to visit my family (I live in the US now) we are all very afraid of even going near favelas. We obviously have to oust these gangs forcefully but the problem is arresting them and locking them up for good instead of just going in the favelas thinking the criminal activity will just disappear. Great post, it’s nice to see the other side of Brazil is not forgotten amid all of the World Cup coverage. It’s sad to see how a sporting event could cause so much chaos.. I wrote a post on FIFA’s next location, Qatar, and the slave labor used to build the stadiums. Feel free to check out my blog and read about it. Have a good one! Very good post, it´s really like that!! In some poor neigbourhood ( Fabelas ) the special army police is 24h. to prevent innecessary kills and thefts. I have saw with my own eyes 2 years ago. Obviously written by some left winger do-gooder who is anti-police.